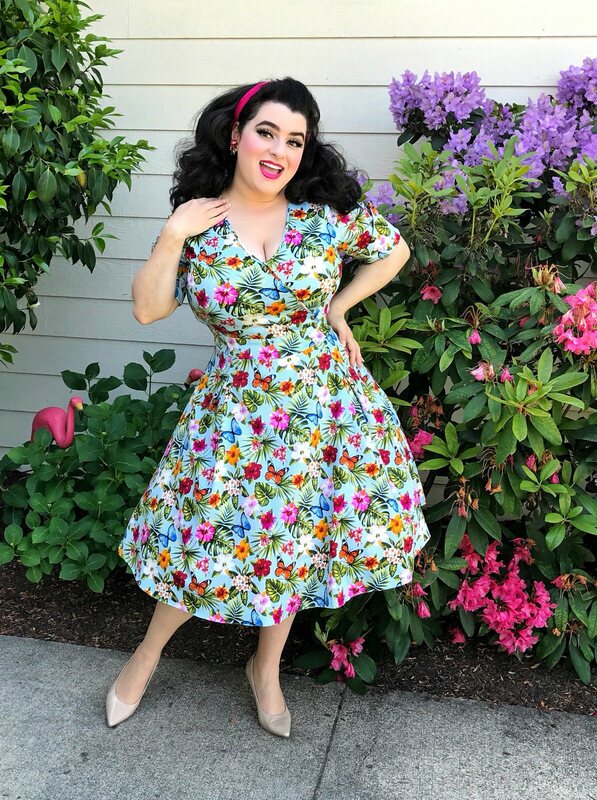 Floral dresses are my absolute favorite!! 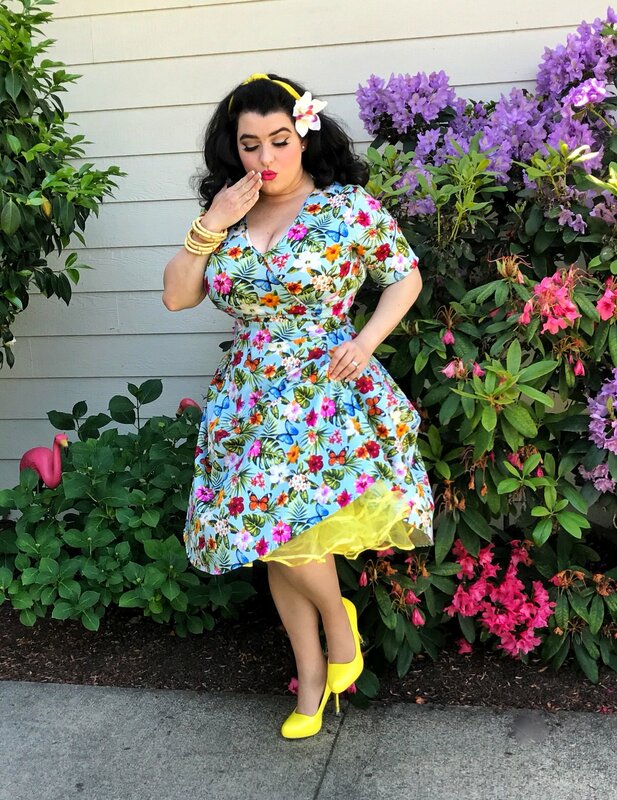 I had been searching for a dress that epitomizes Spring and Summer and this is the dress – it is by Lady Voluptuous and called the Estella in Summer Floral print. What caught my eye about this dress is the variety of colorful Hibiscus flowers, tropical Plumeria flowers, lush green palm fronds and beautiful butterflies against a soft blue background. 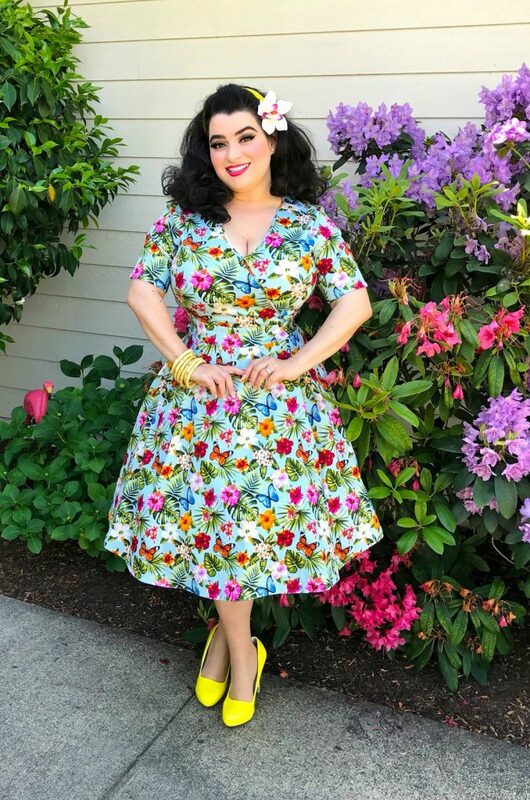 I immediately could see multiple ways of styling this dress with colorful petticoats, hair scarves and flowers in shades of pinks, blues, yellows, oranges and greens. Also, you could easily add Tiki flair to it with some tropical hair flowers and bamboo bracelets and purse. And, because there are so many pretty colors to pick from, adding a striking colored cardigan would also be a great way to style and accessorize this gorgeous dress. For my first look I kept it toned down with a pop of color from my magenta hair scarf. I wanted the dress to be the statement. I kept the accessories minimal with only a pair of vintage floral earrings and a pair of bone colored pumps. For a pop of color is my bright pink petticoat. For my second look that I am calling my Elegant Tiki look, I paired the dress with bright yellow and I think it really makes a statement. I added yellow shoes, yellow hair scarf and a hibiscus flower along with a bright yellow petticoat. I also added some bamboo bangles and my vintage handbag made from woven wicker that has embroidered yellow and orange tropical flowers. And look what landed in my purse… the cutest flamingo!! Let’s talk about the dress’s 1950s silhouette now. Being a girl that loves her full skirts and nipped in waists, I was not disappointed. The dress has a full 1950s circle skirt so adding a petticoat to show off the fullness is truly fabulous. The cut of the bust line is a crossover so it shows curves off beautifully without showing too much. 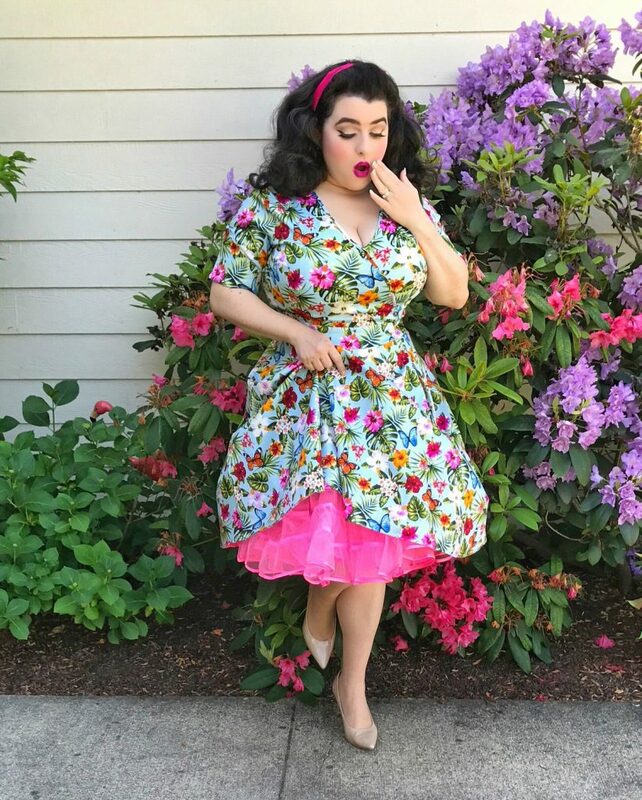 I was a little concerned about how the dress would fit my full bust and if the dress would be tight and therefore give the dreaded pancake look but Lady V London knows how to cut clothing for curvy gals so there was no need to worry. The fabric has some stretch to it as well. I mean look at me; this dress truly fits like a dream!! I am comfortable and can easily wear this dress to work and then out for dinner too. 97% cotton / 3% elastine. You will be cool all summer long in this fabric. 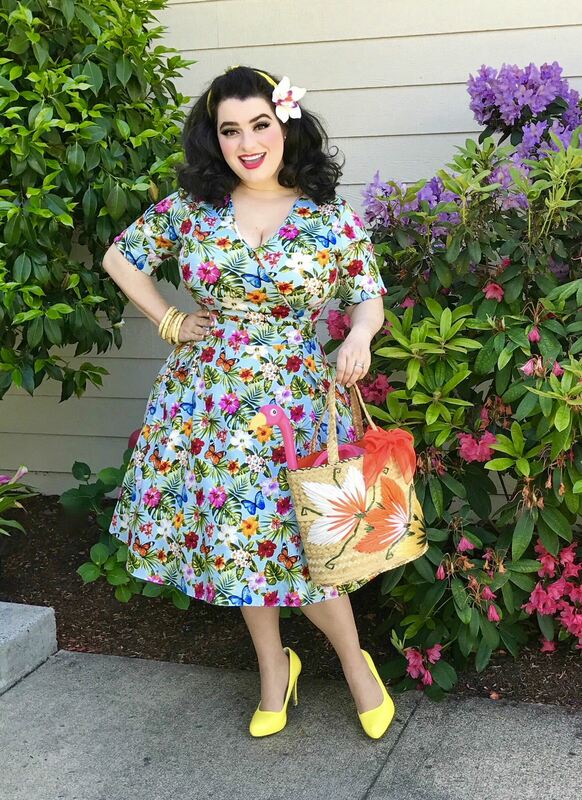 Sizes go up to 30/32 in the Lady Voluptuous label so curvy dolls around the world can dress beautifully. The Lady V London brand is a husband and wife team that founded the company back in 2011 in London. Clothing is all designed in-house + manufactured in the heart of London and supports British businesses and workers. Lady V London is high quality clothing at a reasonable price too. There are two labels to choose from: Lady Vintage up to size 22 and Lady Voluptuous up to size 32. Both have stunning dresses with the same high quality fabric and designs. The company ships all around the world and let me tell you how quickly items arrive; I am in California and items from London arrive in about a week. The staff too at Lady V London is incredibly friendly and helpful. If you have sizing questions or concerns they are ready to assist!! 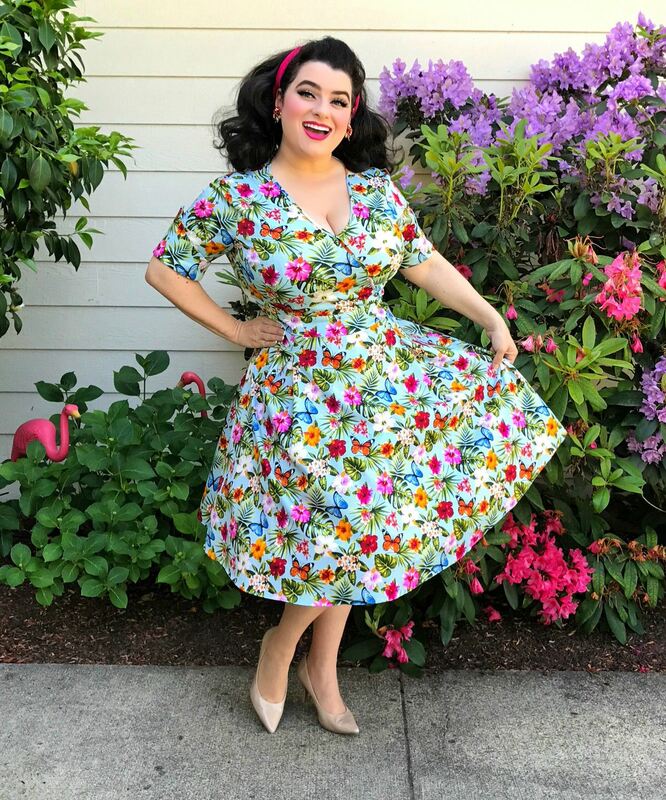 You can find the gorgeous dress I am wearing and so many more (new stunning designs are coming as well… I’ve got my eyes on 3 flamingo prints) so hurry and order before they sell out. You will be so happy you did! !